A-HOTEL.com - Luksusowe i tanie hotele w Vjeternice, Bośnia i Hercegowina. Rezerwacja zakwaterowania w Vjeternice i okolicy. Boasting a garden, an outdoor pool and river views, Holiday Home Kraljica is set in Konjic. Guests staying at this holiday home have access to a terrace. Set in Konjic, in a building dating from 2005, Urban Apartment & Hostel offers a shared lounge and guestrooms with free WiFi. This 3-star hostel offers a shared kitchen. 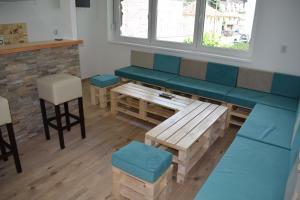 Located in Konjic, Hostel Stecak provides a shared lounge and free WiFi. The tour desk is available to assist guests in planning their days out. Guest House Konjic provides free private parking and offers rooms with free Wi-Fi just steps away from the town centre. Guests have access to a shared kitchen and shared bathrooms equipped with bath, hairdryer and some free toiletries. Located in the centre of Konjic, just 50 metres from the Old Town and the Old Bridge, Hotel Oaza offers air-conditioned rooms, free Wi-Fi and free garage parking for all guests. The on-site restaurant serves local and international dishes. Rania is located in Konjic. The accommodation is 45 km from Sarajevo. Apartments S&S provides accommodation with a kitchen, situated in Konjic. Complimentary WiFi is provided. Big mama's Apartments is set in Konjic and offers barbecue facilities. Guests are welcome to enjoy the free WiFi. Featuring a garden and a terrace, SprinG is located in Konjic. Among the various facilities of this property are a shared lounge and a bar. Offering a terrace and views of the mountain, Hostel Konjic is located in Konjic, 45 km from Sarajevo. Free parking is available on site. Offering free WiFi and garden views, Apartment Raza is an accommodation set in Konjic. This property offers access to a terrace. Konjic-Hostel features air-conditioned rooms in Konjic. All rooms boast a kitchen and a shared bathroom. Set in Konjic, Hostel Musafir offers free bikes. Featuring a restaurant, the property also has barbecue facilities. Situated in Konjic, Hotel Konak Konjic provides free WiFi. Boasting a 24-hour front desk, this property also provides guests with a terrace. Apartman Varda is located in Konjic. This apartment offers a terrace. Featuring accommodation with a balcony, Apartman Prenj is set in Konjic. Guests staying at this apartment have access to free WiFi. Apartman Neretva is situated in Konjic and offers a bar. Guests staying at this apartment have access to a fully equipped kitchen. Villa Rania is located in Konjic. Free WiFi is provided. Set in a garden near the Neretva River and located some 500 metres from the centre of Konjic, Mini Hostel offers free WiFi access throughout and a furnished terrace. Guests at Mini Hostel can find mixed dormitories and a shared bathroom with a shower and a hairdryer. Privatni smještaj u Konjicu features accommodation in Konjic. Among the various facilities are barbecue facilities, a garden, as well as a terrace.